THERE comes a point in our wanderlusting lives when hustling from one attraction to another has lost its lustre. We’ve had plenty of our peers lament about how they just want to go somewhere to soak in the sun and to not do anything. Sure, it might be a first-world problem, but when you can afford to travel abroad and be a lazy bum, why not? With plenty of new tropical paradises being unlocked every day, planning a beach holiday this year is easier than ever. No, you won’t be staying in a rundown shack. Big hotel groups like the Intercontinental, Marriott, and Minor Hotels have either commenced or completed their modern beach resorts and villas in these vacation spots, ensuring you’ll have a five-star stay. 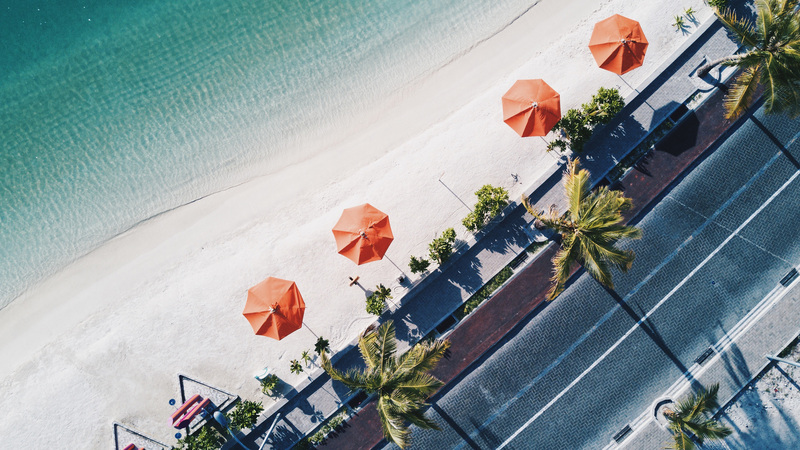 To help you better plan your vacation plans this year, here are our top beach destinations you need to check out this year. Remember to pack a bottle of your strongest mosquito repellant before your flight. You’ll be spoiled for choice should you decide to go to Fiji. The Oceanic country has more than 300 islands in its archipelago, and the white, sandy beaches here are as pristine and idyllic as a beach can be. Its remoteness is also perfect for honeymooning couples who want to get away from badgering relatives. If you’re an aforementioned honeymooner, the best resort would be Turtle Island, an ultra-private and exclusive retreat where only 14 couples can be on the island at any given time. On the island are 10 private beaches, so the odds of you seeing another soul lounging in the sun with you are scarce. There are also plenty of activities to indulge in, like windsurfing, diving, fishing, and hiking. Culture-lovers will surely appreciate the various traditional experiences that come with a Fijian holiday. An example would be the Meke, a combination of dance and story-telling through song. Another resort better suited for families would be the Intercontinental Fiji Golf Resort & Spa. Located just along one of the top-rated Fijian beaches, Natadola Bay, this retreat is nestled within the lush confines of over 35 acres of tropical flora and fauna. 266 rooms (including 50 suites) dot the huge compound. The beautiful Natadola Bay beach and Intercontinental Fiji. While couples would prefer the private hilltop Club Suites, families should opt for the beachfront rooms which can be interconnected. Aside from golf, there’s also the signature Intercontinental Hotels’ Planet Trekkers kids club, which allows parents to drop off their little ones should they desire some time off. Many of us know Seychelles as an entry above “Singapore” in every dropdown list on web forms. But what you might not know is that this slice of paradise is located right smack in the middle of the Indian Ocean, hundreds of miles away from any other civilisation. Seychelles is an archipelago made up of 115 islands that each have their own unique ecosystem. In the 19th century, a British Army General by the name of Charles George Gordon visited Vallée de Mai, and subsequently proclaimed it the lost Garden of Eden. This prehistoric sanctuary is located on Praslin Island and was declared a UNESCO World Heritage Site for one reason: the coco de mer palm trees. Praslin Island is one of the two places in the world where this palm tree naturally grows, and its seed is the largest in the world. The lush canopy created by the trees coupled with its mystical nature dating back to the time of the supercontinents helped propagate the myth that this was indeed the “Garden of Eden”. There are plenty of resorts dotted around the main island of Victoria and its surrounding islands – the Raffles, Six Senses Zil Pasyon (for Passion Island), the Kempinski, and the Four Seasons. But they are institutions that have been around for years. A new property that just underwent a US$14 million restoration is the AVANI Seychelles Barbarons. The resort is just a short 25-minute drive away from Seychelles International Airport, and is located near Barbarons Beach, a curved bay dotted with coconut palm trees and crystal blue waters. 124 guest rooms and suites are among yours to call home after you’ve spent an entire day on the beach. Every night at the beach, there is also a Creole fair where you can explore market craft stalls while munching on the traditional cuisine. When we say Vietnam, the mind immediately conjures up the coasts of Da Nang, the emerald waters of Halong Bay, and the ancient town of Hoi An. But an upcoming beach island called Phu Quoc is set to be the secret paradise your friends will be asking you about. Much of the island is home to the National Park, a lush, evergreen forest that is rich in biodiversity. If you’re pondering planning an outing – yes, you can hike and trek in the park, so remember to pack some good hiking shoes. While it is the largest island in Vietnam, it’s only recently that hoteliers have started developing within the untouched paradise. Two of the leading hotels on the island are the JW Marriott and the Intercontinental. Also of note is the JW Marriott Emerald Bay Resort & Spa, with design and architectur inspired by an abandoned 1890s French university and taking cues from Vietnam’s time as a French colony. There are 234 rooms and suites, and in each type, they have been masterfully designed into a variety of themes. The star of the resort is undoubtedly be the clamshell pool, although you’d need to bring along a drone for that picture-perfect Instagram shot. If you favour modernity instead, consider the Intercontinental instead. When we visited the property last year, it was the sole hotel amongst a sea of cranes and cement trucks. The construction work around the compound did not detract from the whole stay; they were non-factors once past the compound gates. The vast compound of the Intercontinental Phu Quoc. It is a larger resort, with 459 rooms, suites, and villas packed into one lush oasis. The club suite we stayed in still bore the “newly-furnished” scent, a testament to how spanking new this development is. During sunset, make sure you’re up at Ink 360, the rooftop bar with the best panoramic views of Long Beach. Mark Twain once said that heaven was styled after Mauritius. He may have been right; this island in the Indian Ocean comes pretty close to a vision of paradise. Not only are there plenty of beaches with white, soft sand, there is also an abundance of greenery here. Famously, this was where the dodo bird (now extinct, unfortunately) could once be found. Mauritius is also home to two UNESCO World Heritage sites: Aapravasi Ghat, an immigration depot that processed over half a million Indian labourer from the mid 19th century to early 20th century, and Le Morne Brabant, an enormous basalt mountain that is at the core of a myth that it was a refuge for slaves and marooners. Many top resorts have claimed a piece of the Mauritian tourism pie, and if you were looking for luxury accommodation you wouldn’t be hard-pressed to find any. On the eastern board of the island is the Four Seasons, where every guest room is a villa with its own private pool. It’s remote enough that you won’t be bothered by the thronging plebians, and you’ll have access to an 18-hole golf course designed by Ernie Els. There are also monthly golf competitions held here. If that’s not enough exclusivity for you, turn to one of two private beaches. One is only accessible via speedboat. For the younger, adventurous traveller, you may want to check out the SO Sofitel. Designed by famed Thai architect Lek Bunnag and fashion designer Kenzo Takada, the resort is the ultimate escape for millennials. There are many Instagrammable moments to be had here, from catamaran cruises to swimming with dolphins – just be sure to pack in the waterproof GoPro. However, if you’re after that coveted view of Le Morne Brabant, the St. Regis is where you want to be. The resort is on prime real estate, with the mountain behind it, and a turquoise lagoon framed by a white sandy beach in front. Each of the 172 guest rooms and suites has been styled according to Mauritius’ colonial history, but they’ll still come a plethora of contemporary features like your widescreen TV, complimentary WiFi, and the most importantly air conditioning. So have a think and book ahead – the exclusivity of the properties derive from limited capacity as well. The last thing you want is to dream of paradise only to be put on a waitlist.